Chinese pork & garlic chive dumplings, otherwise known as Jiu Cai Jiaozi, happen to be one of the most delicious things on earth. Pan-fried and served with strong, black vinegar and spicy chilli . . . . one of my all time favourite things to eat. I wasn't daring enough to make the dough, but I thought I was pretty brave to attempt assembling them myself. I was very pleased with the results and even shared the excess with Stinky and M.E., who seemed very happy with that. To decide how to make them, I scoured the internet for Jiu Cai Jiaozi recipes and came across the very simple steps provided by Billy from A Table For Two. They were so good I kicked myself for forgetting to thank him when we ran into each other at a Peruvian degustation (see Billy, there was a reason I thought I knew you). These seriously good dumplings are my pasta offering to Presto Pasta Nights hosted by fellow Aussie blogger Haalo from Cook (almost) Anything At Least Once. Recipe by A Table For Two. Makes 30 dumplings. 1. Add all ingredients into a large bowl (except the dumpling skins) and mix well together. 2. Fill a small bowl with water and set aside. 3. Scoop a tablespoon of the mixture and lay it in the centre of a dumpling skin. 4. Dip your index finger in the water, then run it around the edge of the dumpling skin. 5. Fold the skin in half from bottom to top, press the skin together and seal the mixture inside. 6. From the centre, overlapping the skin inwards from both sides until it reaches the pointy edges. 7. Run the edges and press tightly with 2 fingers to make sure the dumpling is properly sealed. 1. Inside bamboo steamer baskets, lay some iceberg lettuce and make sure is flat enough to put dumplings on top without falling over. 2. Arrange 6 to 8 dumplings inside basket without touching each other so they don’t stick together when cooked. 3. Use a wok and pour 2 cups of water and let it boil in medium heat. Place the steamer basket inside the wok and cover it with a lid. Let it simmer for 10 – 15 mins or until the dumpling skins looks translucent then it is ready. 1. Heat up a frying pan with a little bit of vegetable oil. 2. Put some dumplings in the pan and lay flat on one side. Make sure they don’t touch each other to avoid sticking together. 3. Pour 2 tablespoon of water in the pan, and quickly cover it with a lid. 4. Few minutes later, flip the dumplings and fry the other side. Again, pour 2 tablespoon of water and cover it with a lid. 5. Fry the dumplings until crisp and golden brown then it is ready. Billy's note: the dumplings usually go with condiments of soy sauce, sesame oil and black vinegar. A hot spicy chilli paste is also an essential condiment with the dumplings. Anna’s variation: I added that grated fresh ginger for extra kick. This recipe comes from Saveur, an American food magazine which I love. As summer comes closer to Sydney I begin to crave raw seafood drenched in lime or lemon (but never both at the same time!). Adding chillies, coriander and avocado is an additional blessing and this dish is one of my all time favourite meals in summer. It's also another 2009 food challenge since it's another Mexican recipe. Recipe from Restaurante Doña Lala in Tlacotalpan, Mexico. 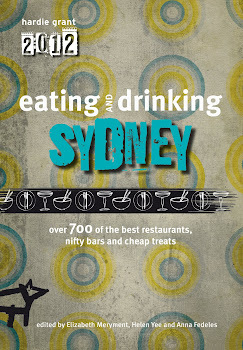 Printed in Saveur Issue #12. Serves 4. 2. Mix together shrimp, tomatoes, onions, garlic and jalapeño. 3. Stir in oil and parsley, season to taste with salt and pepper. 4. Top with avocado and garnish with lime wedges. Note: I added coriander and used cherry tomatoes. As my Weekend Herb Blogging entry, I’m focusing on the avocado. Our host is Katie from Eat This, so go check out the round-up. Avocado has been my theme ingredient in two other WHB posts, one in 2007 (cold avocado soup from the Ivory Coast) and one in 2008 (avocado shake from Vietnam). So here’s 2009 and some avocado information copied dircetly from my 2007 post. In 2005, the world’s top ten avocado producing nations were, in order: Mexico, Indonesia, USA, Colombia, Brazil, Chile, Dominican Republic, Peru, China and Ethiopia. As trees need well aerated soils and subtropical or tropical climates to thrive, this makes sense. In Brazil, Vietnam, the Philippines, Jamaica and Indonesia avocadoes are blended with sugar and milk to create a milkshake. It seems rather decadent to have ice cream for breakfast, and unhealthy too, but this recipe couldn’t be better for you! Would you eat a bowl of natural yoghurt, some banana slices and a drizzle of honey? Well this recipe uses all the same ingredients only blended and frozen in an ice cream machine. This is a case of having your ice cream and eating it too! But, you will need to eat your frozen yoghurt on the day you make it. Sugars and fats are what stop ice cream from seizing up so, since this recipe doesn’t have much of either, you can be sure 24hrs in the freezer will lead to one solid block. If this does happen, you can put chucks into a blender and churn out soft serve, but then you’ll need to eat it fast! Anna’s very own recipe. Makes approximately half a litre. 1. Combine ingredients in a processor or blender. 3. Chill according to ice cream machine instructions. 4. Serve (on the same day) with chopped pistachios and a drizzle of honey. Variation: add ¼ teaspoon of ground cardamom or cinnamon. Sometimes it’s wonderful being a blogger. Like last night when I was shouted a great meal by Peruvian chef Alejandro Saravia whose only request in exchange was that I experience the special produce his country has to offer. Even better I was able to bring my little sister, Stinky, who visited Peru a few years ago and remembers her time there fondly. I was truly excited by this opportunity because I adore trying new tastes and ingredients and, having learnt so much about Andean cuisine when I made it one of my 2008 food challenges, I could finally taste some things I’d only read about. So what did I taste for the very first time? These crispy spheres were a salute to the Peruvian classic Papa a la Huancaína (or Huancayo style potatoes). Normally slices of boiled potato sit in a sauce of fresh cheese, ají, evaporated milk, salt and garlic. 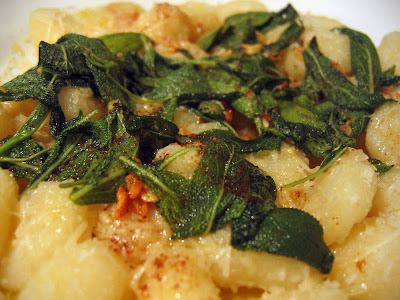 In this exciting version, mashed and chunky starchy yuca was complimented by an ever-so-slight spicy burn and beautiful, strong cheese that I would never have guessed was manchego. This canapé was absolutely lovely. Both the potato and trout gave these morsels a real earthiness. The fish was salty-sweet and the avocado added creaminess. It was doused liberally in rosemary and black pepper oil. Very enjoyable. This was the best taste of the night. The meat was very salty (in a good way), extremely tender and rich in iron flavour. The sauce so divine I wanted to lick it off the plate. The flavours were rich with olive oil, lemons and fresh onions and a mild spiciness lingered in the mouth moreishly. Too good. This cocktail made from lemon juice, syrup, egg white, bitters and pisco (Chilean/Peruvian grape spirit) was a well made Sour and similar to other tangy, lemon drinks. It was good, but I didn’t swoon even though the pisco tasted lovely and smooth. Although we ordered the Don Santiago Pisco Punch, we were served this martini in a tumbler and told it was punch. We were disappointed and then we tasted it. It was amazing! The drink was so fragrant and aromatic, with a sweet aroma, sweet entry flavour and then a sour ending that left you wanting more, more, more. It was made from plum pisco liqueur, grapefruit bitters, old fashioned aromatic bitters and a pink grapefruit twist. Simply delicious! The fish had a gentle flavour and toothsome texture, but I couldn’t detect the pisco it had been cured in. In fact it was slightly dry, but once you flipped it quickly in the rocoto and basil oil it bounced right back. The basil added a slight aniseed flavour which was pleasant, but at the time I thought coriander would have been a better choice. Later, finding coriander in a few other dishes, it occurred to me that the chef might have been avoid a repetition of flavours throughout the night. The Peruvian rocoto (red pepper) was delicious, adding a spiciness that many capsicum don’t contain. This was a ceviche using passionfruit and ají to cure generous portions of pink snapper, prawns and sea urchin. Tasting the thick fatty texture and mild salty-milk flavour of the sea urchin ticked off another 2009 food challenge. The snapper was deliciously tender and the prawns had the most perfect firm, inviting texture when so often they become slimy and soft when served raw. But best of all was the spicy and quite acidic curing sauce, flecked with coriander. I found this dish very impressive and perfectly balanced for my tastes. As a palate cleanser this granita fell a bit short since it arrived practically melted and tasted like an extreme mouthful of Pisco Sour. It was refreshing though. I was dreading this dish because it’s premises was a stuff capsicum (pepper), a vegetable I detest. It came cold in soft shreds on a bed of lukewarm oxtail ragu which was unfortunately gristly and not very flavoursome. Interestingly it was the rocoto that lifted the flavours of the dish. This tiny round pepper was sweet and spicy all at once and tasted the way I’d always hoped other capsicums would taste. Good work rocoto! Alongside it was a truly wonderful salad of doughy, popcorn-like corn kernels called choclo (reminded me of hominy), feta cheese, broad beans and a huacatay dressing (black mint or tagetes minuta). I adored this salad, but does solterito mean bachelor? I was really excited about trying alpaca meat, and it may have been the large amount of wine I’d consumed but it was one of the best meats I’d tasted in a long time. It seemed to be strong like beef or game, yet impart an incredible richness like pork. It certainly had the potential to be dry and chewy (Stinky’s slices were overcooked) but my pink strips were delectable. Unfortunately the quinoa’s earthiness tasted more like dirt and was overpowered by chunks of colourful capsicum. Our dessert seemed like a tribute to Chicha Morada, a Peruvian drink made by boiling purple corn with spices and pineapple. This was the ice cream version, slightly purple, lightly spiced with cinnamon and sitting on a bed of macerated pineapple and strawberry pieces. I just loved the flavour of the ice cream and think I could make my own version if I could get my hands on some Chicha Morada powder. Overall, it was wonderful to taste so many new and exciting ingredients from an area of the world so seldom featured in food media. Thank you Chef Saravia for the amazing experience and, for those Sydney-based people who want to experience their own taste of the Andes, visit the Peru Concept website. This Nigella Lawson recipe is simply delicious. Jonas and I almost devoured the entire between us and I've been craving it ever since. Luckily it's very easy to make and the ingredients aren't very expensive. Too good. Based on a Nigella Lawson recipe. Serves 4 as supper or 8 as a starter. 1. Put the garlic oil in a large pan over a medium heat, add the chopped spring onions and cook for a couple of minutes. 2. Add the thyme and the broccoli, and stir in the heat for a minute or so. 3. Add the hot vegetable stock and bring to a boil, then cover and cook for until broccoli is soft. 4. Remove a few broccoli florets and reserve. 6. Pour back in the pan, add florets and pepper then reheat. Serve hot. Note: Nigella uses frozen broccoli, I used fresh. Broccoli is from the Brassicaceae family, along with cauliflower and cabbage. It’s been part of the European diet for more than 2,000 years and was well-loved by the Ancient Romans. It’s very name denotes its origin, coming from the Latin brachium or branch/arm. Broccoli travelled from the Mediterranean into Asia Minor, only to head back to Italy in the 16th century, northern Europe during the 17th century and then finally to England in the 18th century. Broccoli was introduced to the USA by Italian migrants in the early 1800s, but only became well known in the 1920s. Broccoli is jam packed with dietary fibre, Vitamin C, Vitamin K and Vitamin A. It provides the vital vitamin B that prevent birth defects, is also good for boosting immune systems, maintaining stronger bones, protecting against prostrate cancer and heart disease and contains all kinds of good stuff that equates to a major cancer fighter. This week our Weekend Herb Blogging host is Yasmeen from Healthnut. Be sure to check ou her round-up. It was a case of Revenge of the Dinner! When I stuck my hand into my pigeon to clean out the cavity, the sharp claws of the little beast dug into my flesh and scratched me quite painfully. 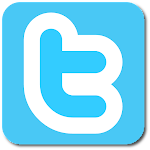 The little bird unknowingly committed a small act of retribution before he was roasted and devoured. As promised when I posted my Duck w Cherries recipe, here is a great Autumn recipe for those in the northern hemisphere. I suppose it's named after the area of the UK where the recipe comes from? Like many ingredients that taste great together, pigeons and plums become widely available at the same time of year, allowing you to easily prepare this delicious Autumn dinner. Just make sure there’s enough for everyone! Recipe from cookitsimply.com Serves 4. 1. Heat the butter and oil in a large frying pan. 2. Coat the pigeons lightly in the flour, shaking off any excess, then add to the pan and fry, turning occasionally, until lightly browned on all sides. Transfer to an ovenproof casserole. 3. Stir the onion into the frying pan and fry gently until beginning to soften. Spoon over the pigeons, then sprinkle the cloves and herbs over the top. 4. Stir the port into the frying pan, bring to the boil, then pour over the pigeons. 5. Arrange the plums over the top. Cover tightly and bake at 170°C for 1½ hours, until the pigeons are tender. 6. Transfer the pigeons and plums to a warmed serving platter. 7. Boil the juices for 2-3 minutes to thicken them and concentrate the flavour. 8. Season to taste with salt, pepper and nutmeg, then pour over the pigeons. Serve at once. For Weekend Herb Blogging this week I'm focusing on the pretty little plum. In Australia, where there are more than 200 varieties grown, plums are available from October to May with the peak season being February to March. European plums are more oval whereas Asian plums are rounder and heart-shaped. Plum skin is usually rather tart whereas the flesh is quite sweet. Most of the sugar in plums is glucose (rather than fructose or sucrose). One of my mother’s favourite memories was when she left me alone with her father and a tray of overripe blood plums. Since those plums were so squishy, and neither my grandfather nor I had any teeth, when she came back we were both smothered in red juices! Generational pincer movement! I was surprised to learn than red-fleshed plums have more nutrients and high sugar contents than yellow-fleshed plums. Maybe that’s why my grandfather and I were so eager to eat those juicy blood plums! Prunes are just dried plums, and both are known as natural laxatives. I’ll never forget how annoyed my brother was after I absentmindedly shared an entire bag of prunes with his 3yr old daughter. Substances within the plum’s seed can decompose into hydrogen cyanide gas and in large enough doses could be harmful, so don’t leave two tonnes of plum seeds to compost in your backyard. This recipe and the plum are my Weekend Herb Blogging entry for the week, hosted by Cinzia from Cindystar a lovely blog from Lake Garda in Italy. I have wanted to cook with wattleseed for many years now, but this year I formalised it when I made it one of my 2009 Food Challenges. Wattleseed is a native Australian product with a delicious coffee-chocolate-hazelnut flavour. Around the world there are so many species of Acacia but only about 120 species (all native to Australia) provide seeds which have delicious culinary value. The Australian Aborigines have eaten wattleseed for around 6,000 years but it’s the recent interest in native produce that has seen wattleseed truly take off in Australia. If you have a choice, it’s best to buy wattleseeds whole then dry roast and grind them yourself. This way the flavour remains strong. Wattleseed can be added to coffee, shakes, whipped cream, ice cream, cookies, pancakes, chocolate sauce and muffins. It’s also useful in a savoury context, being added to beer, bread, sauces and marinades. Recipe by Maggie Beer. Makes 8. 1. Preheat oven to very hot 220C. 2. Sift flour, sugar and wattleseed. 3. Add lemonade and cream. 4. Mix to form soft dough with pastry cutter or finger tips, then place mixture on floured surface. This is a soft wet mix. 5. Bring together to a 2cm thickness and cut with a floured cutter. 6. Place close together on tray, brush with milk and bake for 10 - 15 minutes. These wonderful little scones are my contribution to the High Tea Treats themed Monthly Mingle, hosted by Aparna from My Diverse Kitchen. This is last of the Potato Week recipes and is the best potato bake ever! It’s rich, hearty, cheesy and simply delicious. Using two oozey, melty cheeses I think we hit perfection (and the heights of cholesterol inducement). First up is Cambozola. If you’ve never tried it before, once you do you’re going to regret living all those years without it! Cambozola is a soft, cow’s milk cheese from Germany. It’s white rind exterior and soft, triple cream centre is a similar to Camembert, while it contains threads of mild blue mold just like Gorgonzola. If you had a cheese plate, buy a wedge and leave it out at room temperature before serving. The oozing, delightful result is just divine. The name Cambozola could be a reference to Cambodunum, the Roman name of the city (Kempten) where the manufacturer (Champignon) is located. It might also refer to the cheese being a unique combination of Camembert and Gorgonzola. The second cheese is Taleggio, which most of you are very familiar with. It’s a soft, washed-rind cow’s milk cheese from Italy that melts easing with heat. It’s mild but has a strange yet pleasant flavour, not unlike overripe fruit. Jonas & Anna’s very own recipe. Serves 6 as an accompanying side dish. 2. In a large bowl mix the milk, crème fraîche, crushed garlic, salt and pepper. Whisk until well combined. 3. In a large baking dish, make alternate layers of potato slices, onion, taleggio and cambozola. 4. The final layer should be covered in taleggio then sprinkled with parmigiano. 5. Pour the cream mixture over the potato layers and flatten potatoes with a spatula so that the top layer is resting in the sauce. 6. Cover with foil and bake in oven until potatoes are tender (about 1hr 15-30mins). 7. Once potatoes are tender, remove foil and continue baking until top has turned golden brown. Note: this recipe was written after we made it when we were trying to remember everything! Use your instinct with the measurements (ie more or less cheese / cream mixture etc. Here's Day 6 of Potato Week with another Spanish recipe, and what better for a Friday night than this tapa with a glass (read jug) of sangria. Recipe from Taste.com.au. Serves 4 for tapas. 2. Place potatoes in a large saucepan. Cover with cold water and bring to the boil over medium-low heat (potatoes should still be firm). Drain and set aside for 15 minutes. 3. When cool enough to handle, cut potatoes into 2cm cubes. 4. Pour ¼ cup oil into a roasting pan. Place in oven for 5 minutes or until oil and pan are hot. 5. Carefully add potatoes to pan. Turn to coat. Roast for 40 minutes or until crisp and tender. 6. Meanwhile, heat remaining 1 tablespoon oil in a saucepan over low heat. Add onion and cook, stirring occasionally, for 5 minutes or until soft. 7. Add garlic and cook for 1 minute. 8. Add chilli powder and paprika. Cook, stirring, for 1 minute. 9. Add wine. Increase heat to high and bring to the boil. Cook for 3 minutes or until reduced by half. 10. Add tomatoes and oregano. Reduce heat to medium. Simmer, uncovered, for 20 minutes or until sauce has thickened. Season with salt and pepper. 11. Transfer sauce to a food processor and process until smooth. Return to saucepan. 12. Cook, stirring, over medium heat for 3 minutes or until heated through. Stir through parsley. 13. Transfer potatoes to a serving bowl. Spoon over sauce and toss gently to coat. Serve with alioli. Note: Jonas and I like to make double the sauce quantity then scrape the serving dish clean with chunks of crusty bread. We also add a little more chilli powder to increase the heat. Sticking to my Potato Week theme (today is Day 5), this is my contribution to Presto Pasta Nights, hosted by Joanne from Eats Well With Others. Gnocchi are really Italian potato dumplings, just like Swedish palt, German schupfnudeln, Hungarian krumplinudli, Slovak halušky and Lithuanian didžkukuliai (awesome names, huh!). According to Wikipedia, gnocchi "was introduced by the Roman Legions during the enormous expansion of the empire into the countries of the European continent. In the past 2,000 years each country developed its own specific type of small dumplings, with the ancient gnocchi as their common ancestor. In Roman times, gnocchi were made from a semolina porridge-like dough mixed with eggs, and are still found in similar forms today, particularly in Sardinia . . . The use of potato is a relatively recent innovation, occurring after the introduction of the potato to Europe in the 16th century." This burnt butter sauce is one of Jonas' absolute favourites. 1. Place chopped butter into a large frying pan over medium heat. 2. Cook until melted then add sage leaves to pan. 3. Cook butter and sage leaves, swirling pan often, for 4-5 minutes or until sage leaves are crisp and butter has turned a deep nut-brown colour. 5. Add gnocchi to frying pan and toss to coat in burnt sage butter. 6. 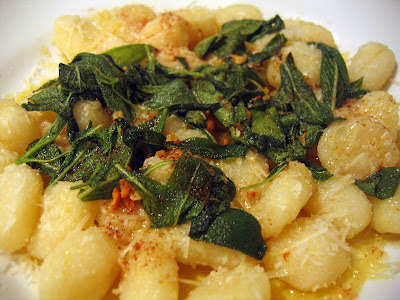 To serve, divide gnocchi among bowls, spooning over any burnt butter that is left in the frying pan. Sprinkle with parmesan and enjoy immediately. Note: I love to add a few tablespoons of toasted pine nuts at the end. Potato Week - Day 4! Now that we've got some Irish in the family, it's time I posted a decent Irish recipe. And if it's Irish, of course the recipe needs to include potatoes. My sister, Stinky, came home from her year in Amsterdam with a lovely Irish lass, M.E., whose stories about "Gordon science" and quaint villages with men reeking of silage put me in stitches. Colcannon, or cál ceannann, is a delicious way of using up leftover cabbage or potatoes by throwing them together into a tasty mash. Traditionally I think white cabbage was used, but I prefer the colour and flavour of kale in this recipe. I could eat a plate of the stuff for dinner without anything else! There are as many colcannon recipes as there are cooks in Ireland, so you could easily find versions with leeks, chives, garlic, ham and bacon. This one's for you M.E.! Based on a recipe by Maggie Beer. Serves 4. 1. Boil potatoes in a pot of salted water until soft but not falling apart. When cooked, drain off water and allow to steam dry. 2. Steam cabbage until tender but crisp, about 2 or three minutes. 3. Warm butter and milk in a pan. Set aside. 4. While potatoes are still warm, put through a mouli/ricer. 5. Add cabbage and spring onion and mix in the milk and butter. Season to taste. Day 3 of Potato Week and guess what? It's Jonas' birthday!!! Happy Birthday old man! I love you! So on his birthday I'll share one of his recipes, this simple rosemary and potato tortilla. Jonas' very own recipe. Serves 2 as dinner. 1. Slice potatoes and onion into thin rounds. 3. Sauté onion and garlic until softened. 4. Add potatoes and sauté until soft (10-15 minutes). Remove from heat. 5. Pick leaves from rosemary twig and discard twig. 6. Mix rosemary leaves, salt and pepper into eggs. 7. Combine the potatoes and onions with egg mixture. 8. Clean the frying pan then add a little more oil and heat. 9. Add potato mixture, shake to settle evenly in pan, then allow to cook until set (5-8 minutes). 10. Lift edges gently with a spatula then flip tortilla onto a plate, sliding uncooked side into pan to be cooked a further 2 minutes. 11. Serve cut into wedges with a side salad. Day 2 of Potato Week! This dish is probably best as a side, but could easily be an easy and comforting winter meal. The flavours are almost like spaghetti alla puttanesca, but instead of pasta it's baked with slices of potatoes and topped with cheese. There's also feta throughout the dish. OK, so it's not the healthiest, but surely it's better for you than a creamy potato bake? Jonas' very own recipe. Serves 6 as an accompanying side dish. 2. Heat olive oil in a pan and fry onion and garlic until soft. 3. Add the tomato passata, salt, pepper and chilli flakes. Simmer for 10 minutes. 4. In a baking dish, spoon a little of the tomato sauce to “grease”, then alternate layers of potato slices, capers, feta and tomato sauce. 5. On the final layer ensure it is topped with tomato sauce then sprinkle over mozzarella and parmigiano, then dried oregano. Note: For a non-veggie version, add anchovies to onions and fry until broken up before adding the tomato passata. Announcing the spud themed Potato Week on Morsels & Musings! My relos, Lynn and Chris, have a farm in Robertson where they grow a number of things including potatoes. This year there was a bumper crop and Jonas and I were lucky to receive a sack of potatoes. They were the most delicious potatoes we have tasted in a long, long time. Prepare yourself for a delicious starch and carbohydrate overdose! 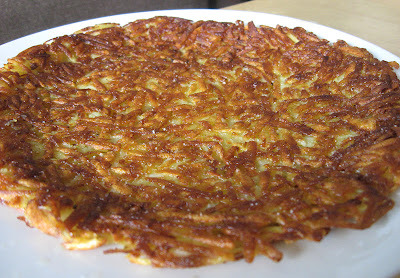 Today I begin Potato Week with the delicious Swiss rösti. These pancakes of grated potato are spectacular for breakfast with smoked salmon, as a fair snack or for dinner alongside meat or poultry. There are great debates about making rösti: whether to use boiled or raw grated potatoes, whether to add ham or cheese or apples, whether to only fry or also bake . . . the list goes on. Jonas is the rösti maker in our home, and this is the recipe he uses to great, great success. His rösti are always crispy on the outside and edges, but with a centre of soft, moist potato (yet never mushy). The only problem with his recipe is that they are too delicious and one is never enough. Jonas’ very own recipe. Makes 2 large (breakfast) or 6 small (sides). 1. Parboil potatoes in salted water, for approximately 10 minutes. Potatoes should be firm but not hard. 2. Cool potatoes to room temperature. 3. Coarsely grate potatoes. Season with salt and pepper. 4. Heat oil and butter in frying pan until very hot. 5. Form potato into patty and fry until golden (approximately 5 minutes on each side). The potato is my theme ingredient for WHB this week. I have already waxed lyrical about potatoes previously, so forgive me from stealing straight from my own post. The root of the Solanum tuberosum is the world's most widely grown tuber and is in fourth place as the most produced food crop after rice, wheat, and corn. China and India are the world's largest potato producers. Research seems to put the potato’s origin in the Andes from Colombia / Venezuela to northern Argentina and the first evidence of cultivated took place in Peru 7,000 years ago. Some 99% of the world’s cultivated potato varieties descend from a subspecies indigenous to South-Central Chile, probably due to the trading routes that carried the first plant exports. Potatoes made the journey to Europe in the mid 1500s and quickly became a staple food crop, particularly for the poor. Lack of genetic varieties in Europe left potato crops vulnerable to diseases, such as Phytophthora infestans, which resulted in the infamous Irish famine and a reduction of Ireland’s population by 25% from starvation, disease and emigration to the New World. Many Slavic, Baltic, Germanic, Scandinavian and Balkan languages derive their word for potato from an ancient word for potato which also meant “truffle”. French, Dutch, Hebrew, Finnish all have names meaning “earth fruit/apple/pear”, whereas Slovak and Polish use words that mean simply “ground”. Different Chinese languages have meanings such as “foreign taro”, “horse yam” or “earth bean”. Although the Hindi and Nepali word for potato is aloo and in Indonesian it is kentang, I don’t know what the base meaning of these words are. Potatoes have excellent carbohydrate content but also good levels of Vitamin C, potassium, Vitamin B6 and traces of thiamin, riboflavin, folate, niacin, magnesium, phosphorus, iron and zinc. The glycemic index (GI) of potatoes can vary considerably depending on the type, location grown, cooking methods and with what it is consumed. Potatoes contain glycoalkaloids such as solanine and chaconine, which are toxic compounds found in high concentrations in wild potatoes. Light exposure and aging increases toxin levels but cooking at over 170°C (340°F) partly destroys the toxins. Affects are weakness, confusion, headaches, diarrhea and cramps and although coma or death could occur, poisoning from potatoes is very rare. Common international varieties include Bintje; Désirée; Fianna; King Edward; Kipfler; New; Nicola; Pink Eye; Pink Fir Apple; Red Pontiac; Rooster; Russet Burbank and Spunta. • Potatoes are part of the deadly nightshade family, a group of poisonous plants including tomatoes and tobacco. 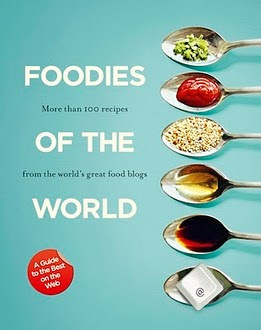 • There are about five thousand potato varieties world wide. Three thousand of them are found only in the Andes, where over 100 varieties of potato can be found in one valley alone! • In France the potato was considered suitable only for cattle. In the mid 1700s Antoine Parmentier devised an ingenious strategy to encourage the French peasants to eat potatoes. Apparently he grew a field of potatoes and had it heavily guarded to make it look like a delicacy for the nobility. The peasants stole samples and started to enjoy them. • Belarus has the world’s highest consumption of potato per capita with each Belorussian consuming 338 kg in 2005. • The fibre content of a potato with skin equals that of many whole grain breads, pastas, and cereals. • The notion that all of the potato’s nutrients are found in the skin is an urban legend. While the skin does contain approximately half of the total dietary fibre, more than 50% of the nutrients are found within the potato itself. Our Weekend Herb Blogging host this week is Susan from The Well Seasoned Cook.